"I think ugly girls should be strangled at birth by their parents. It's bad enough being born a girl, but being born ugly and clever..."
The period romance can be an intoxicating genre, but its devices may seem antiquated. Surely, the formula has been well established, but even with a level of predictability, such a tale can whisk us away to a time when life seemed simpler, but ultimately was not so. Written when the author, Miles Franklin, was in her teens, My Brilliant Career was a fictional memoir that contained touches of autobiographical detail. Its strong, feminist themes were quite radical for the time, and resonated with its readers, especially young girls. Likewise, the cinematic adaptation, a cornerstone of Australian cinema, came at a time when women's liberation was on the move. Sybylla Melvyn (Judy Davis), like many literary heroes before her, is a dreamer. Not unlike the pop-culture strains of Luke Skywalker, she looks away to the future, to the horizon; her mind is rarely on where she is or what she is doing. The member of a wealthy family, she lives in surprising squalor amidst the dusty plains of Australia. Her mother's marriage has led to poverty and hardship, and the young Sybylla is determined not to repeat her mistake. Instead, she has literary aspirations. Why should a woman be defined by whom she marries? Why can't a woman pursue a career, make her own way, and not feel obligated to share another's life before discovering her own? These questions consume the rambunctious, plain-looking girl. She does not depend on beauty or money to save her, but her wits. This is a radical view, no doubt, placing Sybylla in disfavor with her wealthy grandmother and aunt, who summons her to live with them in luxury. Clearly, their intention is to marry Sybylla off into high society; she'll have nothing of the sort, but is perfectly content to enjoy the benefits of rich relatives. Before long, suitors come knocking, most of which repulse the fiery woman. However, a fellow scoundrel, Harry Beechum (Sam Neill), catches her off guard. Their relationship is tumultuous at best, and even though feelings of love are in the air, Sybylla is reluctant to marry. She has yet to discover what is wrong with the world, which, by her own admission, may very well be her. 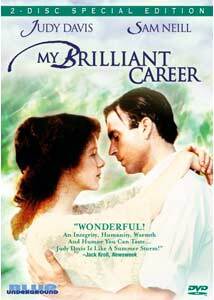 My Brilliant Career is a splendid period romance that is finally available on a quality video format. The debut feature of director Gillian Armstrong, this is a charming and utterly consuming drama that is rife with conflict, irony, and all the bourgeois trimmings. Considering the financial limitations, the film looks gorgeous, aided by cinematographer Don McAlpine and production designer Luciana Arrighi. The plot takes a rather unexpected turn late in its running time, sending the characters careening toward a refreshingly bittersweet ending that is by no means expected but is clearly right. Themes of female independence and strength are front and center, but they are not hammered down with preachy sentiments; instead, the strength of Sybylla's character is paramount. Judy Davis is simply outstanding as the confident and occasionally spiteful Sybylla. She manages to capture the nuances of the role, which demand a certain level of selfishness, balanced with a firm defense of her freedom; a fine line that is walked beautifully, creating a likable, charismatic individual with momentum. Sam Neill's youthful visage is perfect for the troubled, good-natured Harry Beechum; his performance certainly keeps up with Davis'. This film launched both careers. Supporting roles are also well cast, giving the leads some quality companionship. Following a smash debut at Cannes in 1980, My Brilliant Career went on to garner international success. Boasting a female director, lead, and producer, it was a breakthrough in the eyes of many. Who would have thought a 19th-century romance would help weaken the glass ceiling? Image Transfer Review: Blue Underground's anamorphic 1.78:1 transfer is excellent. This film is over 25 years old, leading to certain limitations in the image: grain is still evident throughout. However, the picture remains surprisingly clean, showcasing solid, if muted, color and good detail. This is a pleasing filmic image. Audio Transfer Review: First, there is the option of a Dolby 5.1 EX or a DTS 6.1 ES mix. The discrete surround mix is handled very well, engaging the entire soundfield. Surrounds are used for ambient and occasional directional effects (such as when a carriage rides off screen), but most of the mix is front-heavy. Dialogue can be a bit hard to discern from time to time, but this is a small issue. A Dolby 2.0 mix and the original mono track are also included; both sound relatively clean. Extras Review: Even though this is a two-disc set, the extras are somewhat thin. Disc 1 contains an entertaining detailed audio commentary by director Gillian Armstrong. Her memory is quite vivid here, recounting production details and decisions. This is a fine listen. This disc also includes the film's US and Australian trailers. Disc 2 has some intriguing bits, and I emphasize bits. First is a pair of interviews. We begin with the director (08m:15s), whose most interesting comments pertain to first-time jitters, including her fears of rejection at Cannes. Next is producer Margaret Fink (08m:30s), who discusses the film's extensive preproduction, casting, and more. The Miles Franklin Story (04m:04s) is a very brief biography of the author, whose life was not too dissimilar from that of Sybylla. A vintage newsreel of the film's premiere at Cannes (02m:22s) includes interview snippets from Gillian Armstrong, Judy Davis, and Margaret Fink, all of which share the interesting fashion sense of the late 1970s. All of the extra content is anamorphic, including the trailers. You will also find a poster and publicity photo gallery, and a teacher's study guide, accessed via DVD-ROM. This is a rather thin two-disc set, but the quality of the film itself is the reason for a purchase. Gillian Armstrong's debut feature is a splendidly engrossing period romance. Miles Franklin's themes of female empowerment are certainly intact, portrayed by the stunning Judy Davis with great care. Blue Underground's two-disc set boasts fine a/v quality, but is a bit thin in the extras. Regardless, this garners a strong recommendation.